The Journal of Active and Passive Electronic Devices is an international journal devoted to the science and technology of all types of electronic components. 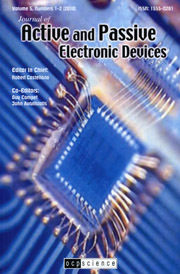 The journal publishes experimental and theoretical papers on a wide array of topics including electron tubes, transistors, integrated circuits, semi-conductor materials, thick-film materials, resistors, capacitors, solid-state memories, thin-film materials processes, analogue and digital circuit design, microwave circuits and systems, optoelectronic circuits, photovoltaics, semiconductor devices, sensor technology, transport in electronic materials, VLSI technology and device processing. Review articles, original articles, short communications, letters to the editor, and book reviews will be considered for publication. Please contact the Editor in Chief for full details. Papers submitted for publication must be in English and must follow a prescribed format. All papers will be subjected to a critical peer-review prior to publication.